Welcome to the ALTEC VISION Readers line, where you can find value deal reading glasses in a variety of styles. Choose from our multi-packs, so you have a pair anywhere you go. Keep a pair at home, at work, at your bedside, and in your bag, so you're ready no matter where you go! Here at ALTEC VISION, we believe in eyewear that complements your lifestyle and enhances your vision in a fresh and modern way. No matter if you are seeking lightweight computer glasses for work, casual readers for when you're curled up at home with a book, sunglasses for the road, or fashion readers to channel your creativity, ALTEC VISION has something for you. We understand that everyone has different needs, and thus we craft our glasses and frames with this sense of individuality. Your vision needs change depending on where you're going, what you're doing, and your personal style. With fashion trends changing all the time, we are always on the lookout to provide new and modern eyewear, and at affordable prices so you can have multiple pairs suitable for any situation. Check out the ALTEC VISION selection of glasses, sunglasses, accessories and more! View your world in a whole new light through ALTEC VISION. DISCLAIMER: This product is not intended to prevent, diagnose, or treat any medical condition or disease, nor is it intended to serve as a substitute for the consultation, diagnosis, and/or medical treatment of a qualified physician or healthcare provider. *NOTE: Lenses are NOT prescription-strength. 4-FOR-1 DEAL: Value pack set of 4 reading glasses for the great price 1! No matter if you're at work, on the go, studying, or enjoying a book at home, you have a pair of readers ready whenever you are. Easily keep a pair in your bag or purse and all of your favorite reading spots. LIGHTWEIGHT & DURABLE: Lightweight plastic frames and plastic lenses with durable spring hinge temples ensure a comfortable fit without uncomfortable pinching. PATTERN DESIGN: Classic rectangular shape fashion frame reading glasses updated with an elegant and colorful design for a flattering look that suits any wardrobe. Universal size fits most face shapes. QUALITY CUSTOMER CARE: 100% Satisfaction Guaranteed. 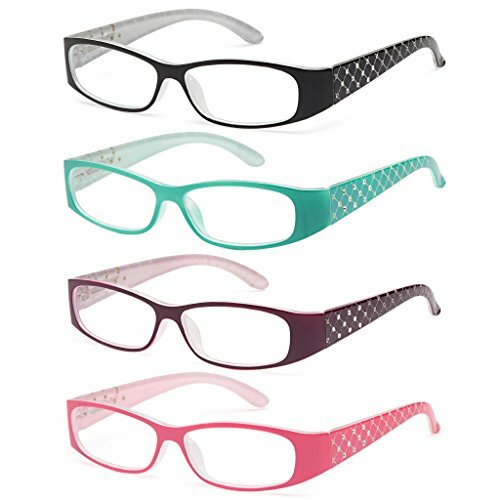 ALTEC VISION 4-Pack Women's Pattern Colored Frame Reading Glasses comes with the ALTEC VISION Brand Guarantee and 2-Year Warranty Against Manufacturing Defects. We are confident that our product will meet or exceed your expectations. If you are not satisfied with the product, however, we readily offer a 30-Day Hassle-Free Money Back Guarantee. Customer satisfaction is our priority. If you have any questions about this product by ALTEC VISION, contact us by completing and submitting the form below. If you are looking for a specif part number, please include it with your message.